The basis of this rumor comes from a Senior Technology Analyst at the Rodman & Renshaw investment bank, Ashkok Kumar, who claims that Apple will update both the iPad and iPhone to have a dual core processor featuring two 1GHz ARM Cortex A9 cores. If true this could offer a significant performance boost on the devices. What’s the source of the information? Nobody knows for sure, but one can speculate it’s from contacts somewhere in the iPad supply chain, or perhaps it’s just an educated guess. iPad 2 + USB Port? Earlier alleged iPad 2 case designs gave some hints as to what the iPad 2 will bring, and as we pointed out there’s a mystery opening on the top of the case that could be appropriate for a micro-USB port. Now a new rumor is giving further credence to this claim, although we have also heard conflicting reports that the top case opening is actually for a light sensor. The source? A reportedly well-connected Russian man who allegedly spoke with an ODM vendor, who claims that iPad 2 will have a USB port. So someone told someone who told someone that the next iPad will have a USB port, hmm… it’d be a great feature but take this one with a grain of salt for now. DigiTimes is hit and miss with it’s rumors, and now they’re claiming the next iPad screen will have “anti-smudge and anti-reflective treatments in order to compete against Kindle and attract more consumers.” Sounds good, although I’d be very surprised if the iPad lost the glass surface. A CDMA iPad rumor? Not too surprising. This one is DigiTimes again,who says that Apple will release up to three separate iPad 2 models that offer Wi-Fi, 3G cellular access, and CDMA compatibility (thus, Verizon). This is based on the cases that are popping up, the current iPad model doesn’t fit and there’s extra room floating around some of the edges. Assuming the cases are real, this obviously means the next iPad is going to be a bit slimmer. Judging by the cases, you can also assume that the back is going to be more flat and that the side bezels may be slightly slimmer. This is widely reported with no real source, but I think it’s common sense speculation just based on looking at the iPad 2 case leaks that are floating around: there’s a huge port at the bottom of the case where the speaker usually is, what else would it be? 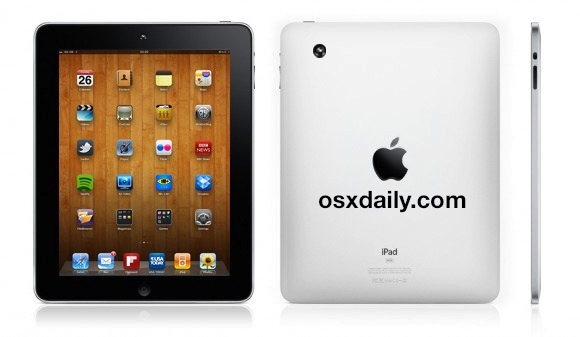 This is nothing new and continues to be a widely anticipated feature of the iPad 2. The leaked case designs show an opening on the back for a camera, and FaceTime is a heavy selling point of the existing iPhone and iPod touch, it would only make sense to come to the iPad. The only thing that would be surprising here is if Apple didn’t release dual cameras for FaceTime support on the next iPad. iPad 2 to have 1.2GHz Dual Core CPU, Dual Core GPU, Faster RAM, Anti-Glare Screen? I like the mockup but you forgot to add the speakers in the lower corner and I think it will be even more flat on the back like an iPhone 4. Also I think there is no chance for USB, where would it go? This is just typical BS rumor, people make things up to get attention and you are giving it to them.